To address this major waste stream, colleges and universities need to focus on food waste prevention. Other initiatives, such as composting or donation of excess edible food, are admirable but only deal with wasted food after it has been generated, and after natural resources have been invested in growing and shipping it and financial resources have been spent buying it. For any college that wants to achieve its biggest environmental and financial impact, food waste prevention needs to be Job #1. And today, colleges and universities need to focus on preventing not just pre-consumer waste--which is generated in the kitchen--but also post-consumer waste--the food students take but don’t eat. 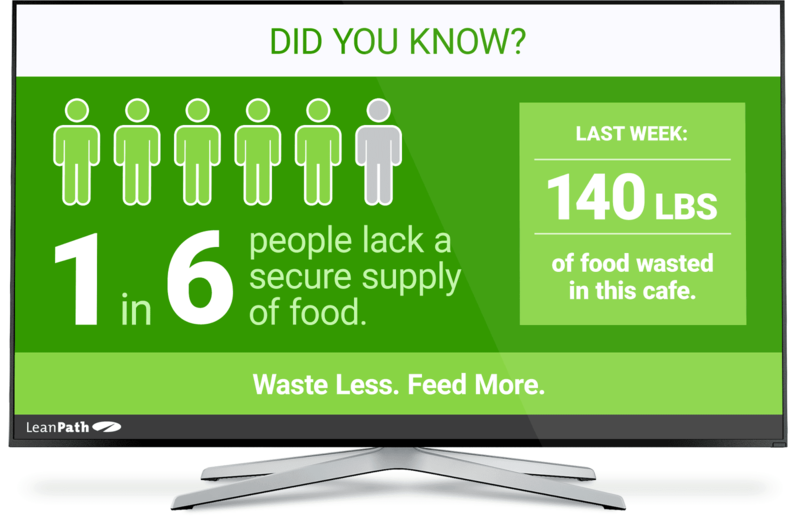 Daily measurement of pre-consumer food waste through digital food waste tracking systems has been proven to reduce pre-consumer food waste by 50% and higher. With LeanPath trackers, food waste data is gathered and automatically analyzed to understand what a kitchen is wasting and why, so informed decisions can be made to prevent it. This occurs largely through establishment of proper controls for overproduction, which is the top source of food waste (LeanPath data shows overproduction is usually around 50-60 percent of total pre-consumer food waste). At the University of Illinois Urbana-Champaign, reducing overproduction includes a number of tactics, including greater focus on safely repurposing excess edible food. Staff are encouraged to create daily specials built around leftovers, for instance. College and university dining programs should also use food production software to manage recipes, menus, purchasing, forecasting and production (e.g. Computrition, FoodPro, CBord). These systems create structure and enable forecasting. But even the best production sheet loses value if it’s not followed. A deeply ingrained fear of running out of food can often lead staff to ignore production sheets and overproduce to ensure no student is unsatisfied. But a production sheet that works hand-in-hand with food waste measurement tools such as LeanPath gives the missing data set that gives staff confidence in lowering production levels. Staff see clearly how much waste is driven by overproduction. With the production system “planning the work” LeanPath ensures the team actually pays attention and “works the plan” as defined--with confidence. This played out at the University of Notre Dame, where they tracked a large amount of sauce waste. They simply didn’t know how much was thrown out until it was tracked. Armed with that knowledge, staff adjusted production sheets and saw overproduction fall. Colleges and universities have long recognized the problem of post-consumer food waste in all-you-care-to-eat environments. Originally, the main tactic to address plate waste was to implement trayless dining to prevent simultaneous collection of excess food volume on a single tray by one person. Trayless dining was shown to be effective at reducing waste by 25 to 30 percent. But colleges are realizing they have an untapped advantage when they turn their attention to plate waste: they have a customer based generally engaged in sustainability who are eager to be a part of the solution. The next generation of post-consumer food waste control at all-you-care-to-eat environments is now focused on real-time measurement of post-consumer food waste, with the data streamed to live digital signage in the café. LeanPath’s tracking and digital signage system, Spark, is being employed to accomplish this. Spark shows students their community’s food waste generation moment-by-moment, along with actionable ways to reduce their waste. In a recent LeanPath study at 5 universities, plate waste was reduced by 37 percent after tracking post-consumer waste and giving students actionable data via Spark. Today, food waste prevention has to be the focus in college and university foodservice. By engaging staff--and students--facilities can not only prevent waste and save money in the back of the house with pre-consumer waste, but showcase their seriousness about tackling sustainability in front of house. Want to learn more about how food service operations all around the world are using LeanPath to prevent food waste and increase revenue? Check out all of our informative case studies here.